Of all the different styles of crafts used by creative folk, beading is one of the most versatile when it comes to conveying an idea or recreating an image. From beautiful lampwork animals, to creative use of seed bead weaving, beaders have an amazing talent for imitating life with art. As I was making my wavy ocean bracelet, it occurred to me that the wedge shape created by the single strands of beads could be used in interesting and unexpected ways. When I thought of different objects that have the same shape, one of the first images that came to mind was corn candy. And since store shelves are filling up with these seasonal treats, it seemed like the perfect time to make something corny and sweet. 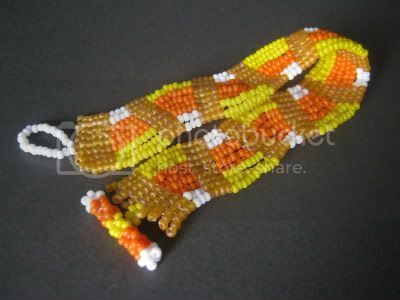 I started with 11/0 seed beads in opaque orange, white and yellow. To make sure that the candy corn sections stood out, I selected some transparent matte orange seed beads, which compliment the other colors without overpowering them. It took some experimenting to find the perfect proportions of yellow, white and orange stripes, but once I had a pattern, the candy corns took shape immediately. Although I like the paler orange square stitch sections, I think adding black would have been really sensational. Perhaps I'll have to make one more! Dear 'Sage:' Thanks for listing Vintage Redux as your Book of the Month! You're a sweetheart! You're welcome! 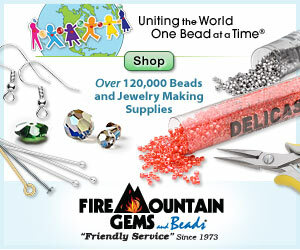 Thanks for creating such a great resource for everyone who loves jewelry AND recycling!